You enjoy a movie even more if it has the unforeseeable factor adjoined to its premise. Thankfully, a number of storytellers in Bollywood are aiming to surprise, shock and charm you with attention-grabbing yarns you haven't witnessed earlier on the Hindi screen. Some get it right, some don't, but what needs to be lauded is the effort to break the mould, to go beyond the stereotype. Vikas Bahl's QUEEN also dares to push the envelope. 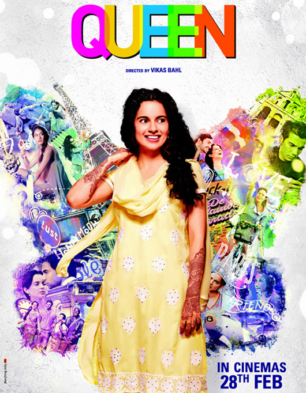 The promos of QUEEN bring back memories of TANU WEDS MANU, partly because the protagonist [Rani] seems like a distant cousin of Tanu. But let's get one thing clear: The presence of Kangna Ranaut and North India setting apart, there's no commonality between TANU WEDS MANU and QUEEN. However, one can draw parallels with ENGLISH VINGLISH, since Shashi in ENGLISH VINGLISH and Rani in QUEEN are vulnerable and low on self-esteem, but eventually find their own voice once they resolve to venture out on their own accord. QUEEN is about a shy and timid girl who travels to Paris and Amsterdam for her honeymoon all alone, when her beau calls off the wedding at the last minute. A quirky concept, yes. But this coming of age story is indeed enjoyable, despite the hiccups. First, the premise! Rani [Kangna Ranaut] hails from a Punjabi family in Delhi. She has led a sheltered life, having been surrounded by her over-protective, but caring parents, doting grand-mom and younger brother Chintu. Rani is introduced to Vijay [Rajkummar Rao], the son of their family friend. Vijay is attracted to Rani and woos her relentlessly. Eventually, Rani gives in to Vijay's charms. QUEEN starts off as yet another attempt to encapsulate the middle class Punjabi set-up [based in New Delhi yet again! ], replete with resplendent song-and-dance spectacle prior to the wedding, but quickly changes lanes as Rani sets out for Paris. Steering away from the conservative route of the woman wallowing in self-pity, Vikas Bahl tells Rani's story with insight and understanding and along with his team of writers [screenplay: Parveez Shaikh, Chaitally Parmar, Vikas Bahl] injects loads of optimism, besides spirited and lively episodes, to portray Rani's emotional rollercoaster journey. 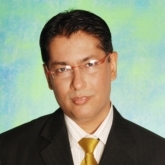 What really works is the way Vikas presents Rani, his lead character. Rani [in her 20s] is no bimbette or abla naari, is stuck somewhere between tradition and modernity, but has a mind of her own. Her experiences outside the comfort zone [on foreign land], the interaction with varied people she encounters in Paris first and Amsterdam later, the atmospherics... the writers unfurl a tale that's utterly believable, besides creating a colorful canvas that's brimming with characters who are *not* cardboard cut-outs. Sure, a couple of episodes may seem quirky, but gel wonderfully in the scheme of things. Having said that, QUEEN isn't fool-proof either. The bloated run time -- almost 2.30 hours -- acts as a roadblock. Also, the story stagnates in the second half. Besides, there are too many songs, especially in the first hour. As a result, the film feels elongated and also indulgent at times. Thankfully, the film is back on tracks towards the closing stages, when Rani meets Vijay in Delhi. The final act is indeed brilliant! There seems to be an overdose of songs [Amit Trivedi] here. 'London Thumakda', 'Hungama' and 'O Gujariya' are effervescent compositions, while a couple of tracks only add to the run time. Cinematography deserves special mention. The DoP [Bobby Singh; additional cinematography: Siddharth Diwan] captures the sights and sounds of Paris and Amsterdam wonderfully. Dialogue [Anvita Dutt; additional dialogue: Kangna Ranaut] come across real. It's hard to take your eyes off Kangna, who captures the nuances of her character spot-on. She's simply outstanding! Even when the goings-on appear stretched, Kangna doesn't miss a beat. The earnestness and sincerity she invests in her performance is for all to see. Additionally, the deglam look and the attire [jeans, kurtas, sweaters, handbag] makes it so believable. It won't be erroneous to state that she turns Rani into the most real woman you've encountered on the Hindi screen lately. Rajkummar Rao sparkles in a role not many actors would've dared to take up, while Lisa Haydon is simply delightful and supremely confident, complimenting Kangna through and through. Mish Boyko [as Olik], Jeffrey Ho [as Taka], Guitobh Joseph [as Tim] and Marco Canadea [as Marcello] contribute wonderfully to their respective parts. The actors enacting the part of Kangna's parents, especially the grand-mom, are lovely. On the whole, QUEEN reinvents the genre with its non-formulaic screenplay and skilled direction. A charming little film, this one's made with heart and feeling and it shows. Absolutely recommended!